In the years following World War II, the United States took on a new shape and so did the way Americans ate. The 1950s witnessed the rise of “packaged-food cuisine,” a dietary change and gastronomic phenomenon that had as much to do with the postwar military industrial complex, women’s issues, and class-consciousness, as it did with food. This selection of five images explores these themes, using convenience food as a lens to explore the socio-cultural context of the 1950s. Created in 1921, the name and face of Betty Crocker has appeared in American grocery store aisles, pantries, and cookbooks for more than 90 years. Betty Crocker was developed as a “live trademark” by Marjorie Child Husted for Washburn Crosby, the company that made Gold Medal flour and would become General Mills. The Betty Crocker character formed bonds between customers and brands at a time when convenience cuisine was in its infancy, but primed to grow quickly. I guarantee a perfect cake every time you bake – cake after cake after cake. Artist Neysa McMein painted Betty Crocker’s first official portrait in 1936, portraying an attractive yet stern countenance that exudes a calm confidence. 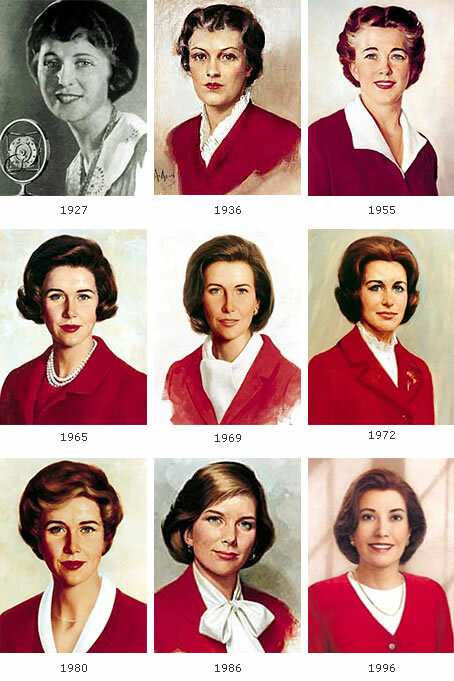 Updated throughout the decades of the twentieth century, General Mills contends that Betty Crocker’s images reflect the look and character of the women who are her customers — at least the white ones anyway. Appearing in print and on food packaging, the radio, and for a short time even television, Betty Crocker is an icon of American packaged-food cuisine. Expressing love, requiring effort and skill, and demonstrating feminine mastery, cakes communicate potent symbolic meaning. A challenge for many a housewife to execute, cake mixes provide a prime example of an early convenience food product. First introduced in 1931, mixes simplified the cake baking process and promised a successful result, no matter the baker’s experience. As this advertisement demonstrates, a woman’s baking ability was also read as subtext for her ability to please her man and fulfill her feminine duties, inside the kitchen and out. Food marketers also emphasized how convenience products made even complicated cooking, such as baking a cake, quick and easy. 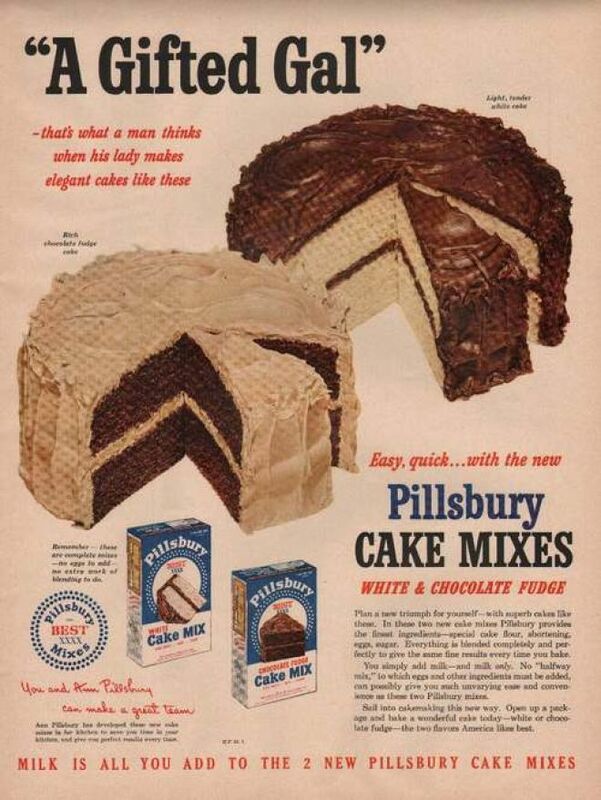 The white and chocolate fudge Pillsbury cake mixes featured in this advertisement required the cook to simply add milk to the mix. This approach did not thrill housewives, however, as cake mixes effectively engineered out the culinary labor that women felt was their moral, social, and emotional responsibility. Psychologist and marketing expert, Ernest Dichter, posited the “egg theory”—that allowing women to add eggs to the mix would ensure that they felt they had more fully fulfilled their cooking responsibilities. Those were the days when cake mixes were miracles; when using them was like having the essence of the modern world in your own kitchen (Shapiro 2004: 73). Kitchen technology ruled the 1950s domestic space, promising to make a housewife’s work quick and easy. While the decade’s fascination with technology resulted in many new, specialized kitchen gadgets, Ruth Schwartz Cowan asserts that such devices did not reduce the housewife’s labors, but rather elevated expectations for cleanliness and overall execution. The Mixer, Hand Mixer and Blender Cookbook demonstrates the use of three kitchen gadgets that have earned a permanent place in many an American kitchen. The blender in particular won over gastronomes, including Julia Child and Alice Toklas. 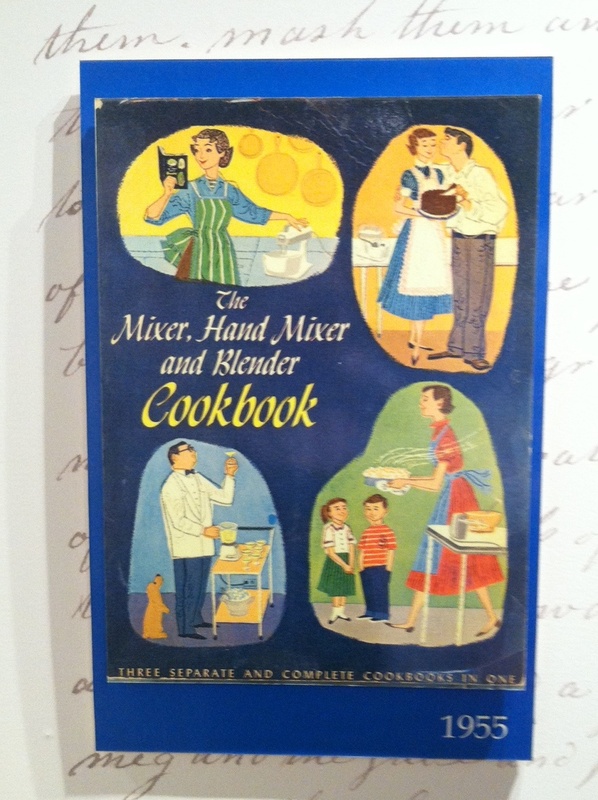 The cover of this cookbook also communicates the binary gender stratification of cooking in the 1950s. As shown in the images on the right, women cooked out of a sense of responsibility and often as expected expressions of love for husbands and children. A subset of cookbooks targeted brides specifically, coaching young anxious women how to correctly fulfill housewifely duties. This cookbook cover also depicts the iconic American housewife of the 1950s: slim, coiffed, and nonplussed, she happily and effortlessly performs her domestic labors. With such fantasies to live up to, it is no wonder that women of the time experienced identity anxiety, sought short cuts to cooking, and explored other venues in which to express themselves. Among the many social changes of the 1950s, a growing number of women worked outside of the home. These workingwomen comprised Poppy Cannon’s target audience for sophisticated convenience food, recipes for which were immortalized in The Can-Opener Cook Book. 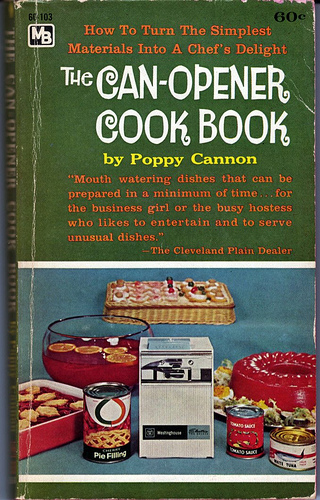 While James Beard considered Poppy Cannon and her can-opener cooking the symbol of “everything that was wrong with American cooking in the postwar era” (Shapiro 2004: 5), Cannon’s food work tells a far more complex story about women and cooking in the 1950s. While canned foods had been widely available across the United States since the nineteenth century, the 1950s packaged-food cuisine ushered in a time when complete meals were created by opening cans and mixing the contents. While modern diners may cringe at the recipes, wary to taste them, can-opener cooking demonstrates the concepts of “creativeness” and “glamorizing” (Shapiro 2004). Cooking with bland-tasting canned goods, housewives engaged their creativity to “doctor up” the contents, ensuring a tasty result. Furthermore, glamorizing ensured that sophisticated haute cuisine was within reach for every housewife, for aspirational recipes emphasizing presentation could be made from packaged ingredients. The “original gourmet in a hurry,” Poppy Cannon popularized what she and her readers considered sophisticated convenience cooking, allowing particularly working women the flexibility and support to cook luxurious meals using shortcuts. Through the years, Cannon wrote for Mademoiselle, House Beautiful, and the Ladies Home Journal and published several cookbooks. Her cooking advice embodies the loaded food choices that women could make in the 1950s, perhaps none more important than: to cook or not to cook? Kitchens are powerful sites of American mythmaking from dutiful, nonplussed housewives to well-behaved children and unified families. In the 1950s, the American landscape changed with the rise of suburbs and single-family homes. Subsequent changes in kitchen design resulted in larger kitchens with open floor plans, freeing women from a small, secluded room of servitude, and giving them a gadget savvy command center for the home. As a locus of consumer desire and symbol of middle class comfort, the kitchens of the 1950s took on a more substantial role within the home. Kitchens also became spaces for fashion and feminine expression. As depicted in this image, model kitchens, and the salesman who retailed them, encouraged women to “dress” their kitchens in the latest fashions, as they did themselves. 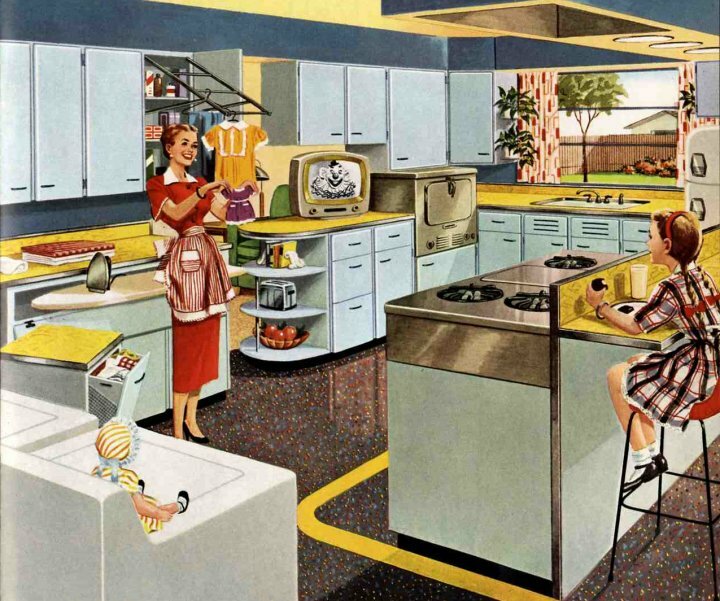 This particular image further feminizes the space, featuring a slim and attractive housewife, a cute and attentive daughter, and an alert baby doll on top of the washing machine. In the 1950s, kitchens also came to symbolize prosperity and patriotism. For example, the 1957 Paris Exhibition of the Future featured “Frigidaire’s Dream Kitchen of Tomorrow.” Furthermore, the dream of the “American techno-kitchen,” immortalized in the 1959 “Kitchen Debate” between Vice President Richard Nixon and Prime Minister Nikita Khrushchev, stands out as a powerful example of the kitchen as a symbol of status and the success of consumer capitalism. The American kitchen of the 1950s embodied the ideals of the decade—freedom, consumerism, and materialism—and laid the foundation for kitchens to follow and the women who cooked in them. Any reader interested to learn more on this topic should read Laura Shapiro’s wonderful book, Something From the Oven: Reinventing Dinner in 1950s America.